Q: Name a country with at least three consonants. These are the same consonants, in the same order, as in the name of a language spoken by millions of people worldwide. The country and the place where the language is principally spoken are in different parts of the globe. What country and what language are these? On the lists I checked, both the country and the language rank somewhere in the middle. Edit: The hint was "rank" which contains the consonants in one of the answers. Blaine, "rank" contains the consonants in both UKRAINE and KOREAN, yes? I don't think they spoke ROMAN in ARMENIA. Yes, I know the Romans spoke Latin when in Rome, but when in Latnia they spoke Babylonian. Some might dispute one of the answers. I thought the winner today on the puzzle was unbelievable. I bet he got the answer by the time Will stopped reading it. I had the same issue that he had, too, that I didn't answer a call from NPR on Thursday at noon...but fortunately got called again a year later. Notice that Will said "different parts of the globe", NOT different continents. Well, if there's some "Middle-earth" language involved, I'm afraid I'm lost. The wording of this week's challenge doesn't preclude intervening consonants in the solution. It specifies ONLY that 3 or more consonants must occur in the same order in both the country and the language, therefore SWITZERLAND & SWAHILI, which share 3 consonants in the same order, qualify as an acceptable answer; however, I am sure this is not the intended answer. OK ... if you think that's better ... thanks again! Someone hit the spot on my neural map; I won't say who. I'm just happy to be able to think of anything else between now and Thursday afternoon. Here's my clue: the target country and the country with the most speakers of the target language are in different continents. All that really matters is that we don't become incontinent. V pna frr guvf tbvat Fbhgu nyernql. Now to try figuring out what hugh's up to. Not easy to hint at my answers. I believe that the name of the language and its (historic) country of origin would also qualify as an answer, per a legalistic reading of the puzzle. For those who read it, I maintain that the deleted post WAS NOT THE ANSWER. Well, Ken, I for one am going to be MOST interested to see (after Thursday) why you feel that the answer you had posted (before deleting it), which is the very answer I had already sent in, before coming to this blog today, is NOT the correct one. Because the language in question (for your and my deleted comment) is not as widely-spoken worldwide as another one, for which there is one equally-valid answer. In addition, there is a second answer for the more-widely-spoken language, although in that case the name of the country is an informal or historic name,. But there wasn't a mention in the NPR puzzle that the language had to be spoken by the MOST people anywhere, just by millions, which our deleted language IS (like by 80n million or so.) Thus, I still don't understand why you think the 'known' answer is really any ess valid than the other one which you apparently have? Ken, PLEASE DELETE your earlier post! Blaine, PLEASE DELETE Ken's earlier post. I can't believe it's been there almost an hour now!! Not trying to be picky, but I see a problem with the wording of this puzzle. We are told to name “a language spoken by millions of people worldwide.” But the puzzle also refers to “the place where the language is principally spoken.” How can a language spoken worldwide be confined to a place? English is spoken worldwide, but the "place" with the largest number of English speakers is the U.S. I think the wording was chosen deliberately. My country and language don't fit some of the hints here. The capital of the country and the capital of the country where the language is primarily spoken are about 1000 miles apart. Look again at my 1st post. My country & language center are also about 1000 miles apart. 4,500 miles for the country and language I submitted. With me it was just a matter of finding a country with exactly three consonants, and finding the language with those same three consonants in that order, and actually I knew what the language is just by glancing at the country. Rest assured in this country they don't speak it. I've got an answer where it's over 8000 miles apart, but under 9000. I wonder how many answers there are! --Margaret G.
I have the 4500 answer too - I think that's the more likely of the "right" answers, and the one I'm submitting to NPR. My 8000 one is too informal. --Margaret G.
9000 different hemispheres and continents. Any two points on the surface of a sphere are in the same hemisphere. For that matter, any three points on the surface of a sphere are in the same hemisphere. Just sayin'. Is that why it is so difficult to hem a sphere? Which hemisphere is the equator in? Or is that an ignorant question? Yes, Margaret G, it can be nip and tuck sometimes. I prefer to nip while I am tucking, if you know what I mean. Paul, I think it depends on where you draw the line. jan, I guess there will always be the Halfs and Halfnots. To which hemisphere do the points on the circle, which is the intersection of the plane with the sphere, belong? I feel I would be grossly remiss if I were not to take advantage of this wonderful opportunity to compliment you on your delightful editing and proof reading of your most eloquent post just above. Perfect punctuation, with no excessive or absent commas; no missing caps or inappropriate punctuation throughout. A genuine pleasure to read and not at all overly verbose. I salute you. Good, Leo. So, would a worldwide epidemic perhaps be a Sphere of Influenza? To help conclude this chat about hemispheres, may I recommend Wikipedia's page on the Eastern Hemisphere? I sphere not. Depends on the hemi-tology. But I don't want to talk in circles. Otherwise, I'd lose my edge. What I want to know is, back when the Earth was flat, how did the ocean water keep from dropping off the ends? I worked with a short list containing both languages and countries where they are spoken assuming that spelling would be consistent, and popularity would cause inclusion of the answers. Only one language fell out, and it doesn't seem to be that widely spoken. I'll go with 4500 mi. Not too inclined to work with longer lists. I agree. One list and one answer is enough. As for the distance, I can't decide between 4558 miles and 4417 miles! You're not making me feel better. This puzzle isn't really hard. It just came down to some spreadsheet magic to find the answer. I, too, came up with the 4500 mile answer. Found these answers in a popular book. I know it's more popular to transliterate it with a Q these days, but I'm guessing you are referring to the central religious text of Islam. I'm in the 4200 mile league; I hope I've chosen wisely. My hint was somewhat obscure: Chosen is an archaic name for Korea and is still used by Japanese speakers as the name for North Korea. And I vote slightly under 1000 miles. I too am at 4500 miles. My parents once "adopted" a family of immigrants who spoke the language that is in my answer, in part to help with their ESL studies. Next week's challenge: This is a spinoff of the on-air puzzle. 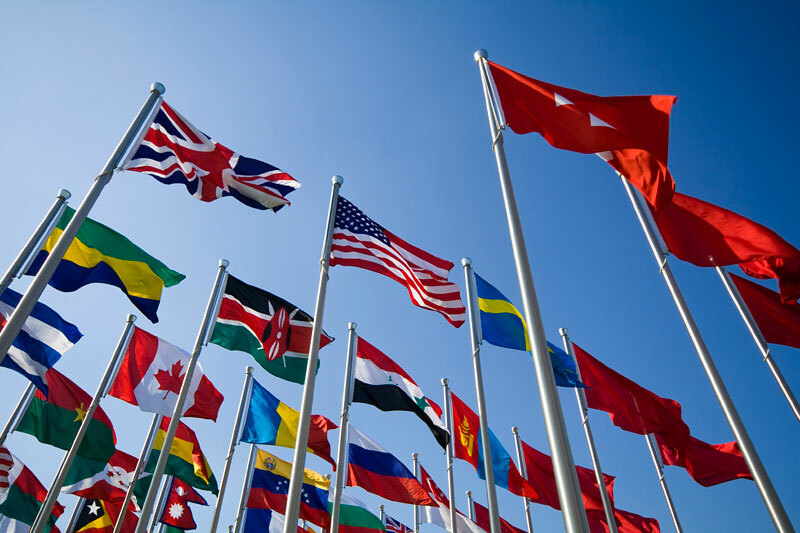 Name a country with at least three consonants. All of the consonants in the name of this country are also all of the same consonants, in the same order, as in the name of a language spoken by millions of people worldwide. The country and the place where the language is principally spoken are in different parts of the globe. What country and what language are these? Obviously, many are taking the original wording of the puzzle to simply mean "Name a country with at least three consonants. Take any 3 of its consonants, in the order they appear in the name and these same consonants, in the same order, appear in the name of a language spoken by millions of people worldwide. The country and the place where the language is principally spoken are in different parts of the globe. What country and what language are these?" I think we should adapt the former, my improved wording, as the official intent of this week's challenge; as there are many answers under the latter interpretation. One clear-cut ridiculous example: Bangladesh not only has all 4 consonants, in the proper order, as the language Bengali, but also ALL 5 consonants, in the proper order, of the language English! I now recommend that we replace the bold text in my improved wording above to: "All of the consonants in the name of this country are the same as all of the consonants,"
EaWAf: I agree that your suggestion could make things more clear. However, I find the puzzle to be stated sufficiently because it says "These are the same consonants," rather than "These same consonants are found..."
That is, I think the definite article is definitely definite. Under the scrutiny of a lawyer there might be some faults in the wording, but I think you lift it up to tear it down. Will says, “The country and the place where the language is principally spoken are in different parts of the globe.” Well, my house and my next-door-neighbor’s house, a shot put’s throw away from mine, “are in different parts of the world” also! My answer this week is the one many Blainsvillians seem to believe is Will’s intended. The country and the place where the language is principally spoken are a bit more than 4,000 nautical miles apart, though nautical would not seem to be germaine. From the "these three consonants are found in order, but not necessarily cosecutively gang": We have a local form of English and an European country. These are the same consonants, in the same order, as in the name of a language spoken by millions of people worldwide. They say it exactly right - not too much not too little. Blaine, I have an idea for one of your blog posts, how should I contact you? As I post this, it has been a few hours since David Letterman said goodbye. Pretty good show. Surprised to see Tina Fey fully dressed. Anyone else see her striptease a few weeks ago? Fine-looking woman, if you ask me. Anyone else here a regular Letterman viewer? I vaguely remember his morning show. The offspring of these two would be a congenital alcoholic. I'm of much better parentage, leaving me w/o excuse. I got to the Great Divide, made the appropriate adjustments to my instruments and scanned the horizon to find 2 of the 3 landmarks. Germany - Only because it made it through the filter. Last Sunday I said, “Some might dispute one of the answers.” While it’s true that English has a couple more consonants than NGL, this isn’t specifically prohibited by the puzzle. It just says that the same consonants in the language have to appear in the same order as in the country. And they do. Ukraine (krn) and Korean (krn) are an exact match, but I wouldn’t consider Korean a language spoken worldwide by millions of people. Wikipedia thinks so: "About 80 million people speak Korean worldwide." Thanks for trying to make me feel better, Chuck, but I'd still like to apologize for stomping all over your excellent Julie London reference with my ill-begotten and uncouth "Goddamn Army" quote. I have no intention of ever entering the contest again, so if I don't get the answer in a few minutes, I come here and shamelessly look for helpful hints so, as someone else suggested, I can get on with my so-called life. But the hint which involved "The Bahamas" and "The Gambia" I thought was awfully close to a giveaway, since "The Ukraine" is the only other example I could think of (this being before the actual answer was nakedly presented.) It gave me the answer immediately. Want fries? >> No, I'll have my potatoes mashed. >> MASH >> Korean War >> Ukraine >> Korea. Anyone w\o thinks Korean isn't spoken by millions around the world should visit Bergen County, New Jersey, among other places! A third answer is Uganda (nation in Africa) and Gondi (language originating in a region in India, spoken by 2 million people worldwide according to Wikipedia). Letters are GND. I got UKRAINE / KOREAN from Leo's take on your comment and assumed that was your intent as well. This kind of stuff really knocks me out! Was Jo Jo on your mind? No, Georgia's always on his mi-mi-mind. JoJo was a man who thought he was a loner. Do Armenia and Romani fit the profile. Felt like getting second place last week: WS mentioned my other answer: picked the range of answers on the "other " puzzle site: and Jan replied to my very first post here. I got the Korean Ukraine answer. I also think that Will *might* accept Amharic (spoken in Ethiopia) and America, although America is not an official country name. --Margaret G.
Amharic (MHRC) and America (MRC) do not provide equivalent sets of consonants. I think Ukraine/Korean and Lebanon/Albanian are the most plausible answers. I think LB and E&WAf are correct. Besides the intended answer, UKRAINE & KOREAN, I think the only alternative answer that will be accepted is jan's alternate answer, LEBANON & ALBANIAN. I'm going with UKRAINE KOREAN. I'm also going to Ft. Walton Beach, Fla. for Memorial Day weekend. ALBANIAN, spoken by 5.4 million people. The distance between Tirana & Beirut is 996 miles. KOREAN, Ken's “atrocious giveaway.” Distance = 4695 miles. Third answer: ROMANIA or ARMENIA & ROMANI (the language of the Gypsies). How come this site: http://www.chemical-ecology.net/java/capitals.htm says there are 951 miles between Kiev and Seoul? Is there a short cut tunnel? Jim, I am shocked, shocked, to report that you cannot believe everything you see on the Internet! Thanks Bob for elucidating! That must explain it. for what it's worth, I wrote "... I think you lift [u-crane] it up to tear [careen] it down." Subtle synonyms for homophones for Lebanon and Albanian (or Armenia/ Romani) are way beyond my pay grade. Greetings from beautiful Ft. Walton Beach! Arrived a few hours ago, couldn't post on this blog sooner because my Kindle had to recharge. My family will be joining us sometime tomorrow. Spent most of the day in the car or grocery shopping. Come to FL if you've never been. It's great! Have a wonderful holiday, pat-bob. Be there in two weeks. Next week's challenge: The challenge comes from listener Ed Pegg, Jr., who runs the website mathpuzzle.com. Take the phrase "merchant raider." A merchant raider was a vessel in World War I and World War II that targeted enemy merchant ships. Rearrange the letters of "merchant raider" to get two well-known professions. What are they? Aren't merchant and raider two professions themselves? It's strange how Will's puzzles seem to run in groups. While the theme is totally different, one of the clues to last week's puzzle would also be a good fit to this week's. Not necessarily the best name for one of the professions. zeke's bio bro went to trade school to become one. He couldn't even spell it, now he says, "I am one." This was Carl Huber's second appearance on the Puzzle. P. S. There's only so many ways to go on this one. . . I thought it was Honduras and Hindi. Doesn't that work? Strictly speaking, depending on one's reading of the puzzle terms, it does. However, the extra R and S make the solution less elegant, at a minimum, and incorrect by most interpretations.